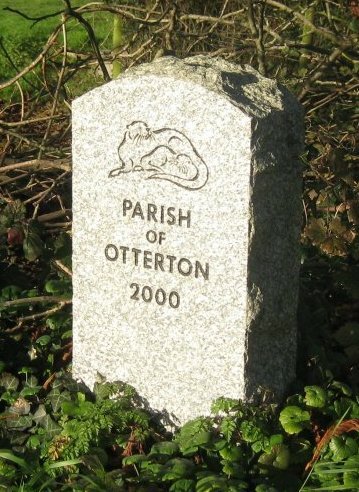 From 1086 The Lord of the Manor of Otterton was the Abbot of Mont St. Michael , Brittany, France and in due time a Priory was built close to the old Church which retained much Land for its own use, known as the Demesne. Farm buildings were built which with the Harbour below became the centre of the Village. By the 15th.century a house had been built close to the farm buildings to house a bailiff. The earliest bailiff recorded was John Stubbs in 1408.This during the time of the Abbey Mont St. Michael’s ownership of Otterton Manor. The Listed Buildings Schedule states “Former Farmhouse, probably monastic origins. Early 16th, century, radically refurbished and rearranged circa 1850”. “The original 5 bay roof survives but the trusses have been cut off below collar level. They are true cruck trusses of enormous scantling with remains of chamfered archbraces and windbraces”. “ possibly house built originally as a barn belonging to the monastery” ie the Priory. From 1420 Bailiffs were appointed annually by Syon Abbey, which had taken over the Priory and some Bailiffs certainly lived elsewhere eg. John St. Clare lived at Tidwell Manor. It has been quoted by Michael Harrison that Sir Peter Courtenay was farming the Manor in 1389. This may suggest that this was the Demesne Farm. After the Reformation and Richard Duke’s purchase of the Manor it is possible that he was living in the House pending the building of the Manor House next to the Church. The 1905 Ordnance Survey Map names the “Manor Farm formerly Manor House” which indicates that farmhouse had occasionally been used by the Duke family. 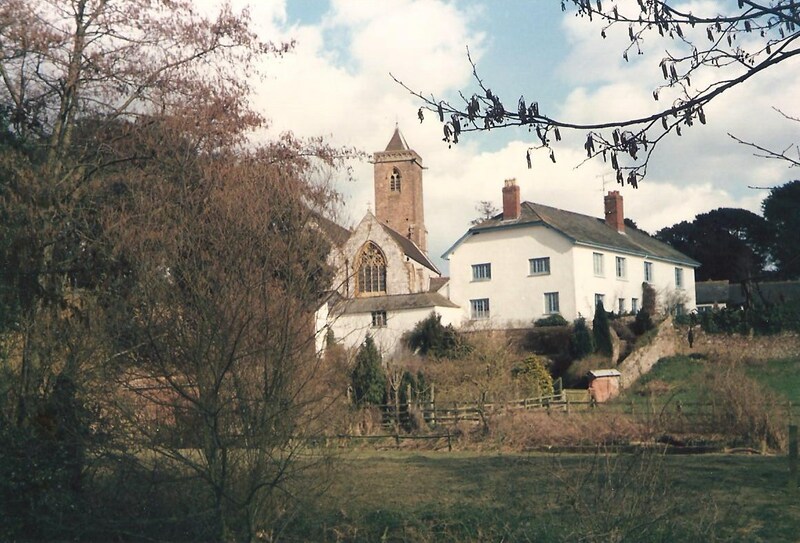 In January 1779 Otterton Manor was put up for sale by auction. An Advertisement had appeared in Truemans Exeter Flying Post for 4th. December 1778 stating that the “Manors of Otterton and Little Otterton ie. Yettington were to be sold with their rights, members and appurtenances, mostly in demesne, partly by Freehold tenants and partly by Leasehold and Copyhold tenants: with the healthy and extensive Common called Peak-Hill........and the capital Barton and Farm called Otterton Barton”. The Auction Prospectus lists the land in demesne as “Otterton House, offices, outbuildings, yards, gardens etc.etc......together with rich and fertile Barton or Farm of Otterton – 751 acres, rack value £753 per annum.......there is upwards of 184 acres of saltmarsh ground belonging to the Farm which might at a very moderate expense be inclosed .......There is a 2nd saltmarsh of 30 acres belonging to the farm.........There is also a valuable lime rock on this farm which will....furnish manure for the land...”. The Barton is in hand and being farmed by the Duke’s Steward. Later in December 1779 a 14 year tenancy is being offered in the Flying Post and John Wood is named in occupation with others. In 1781 Thomas Tillman was granted a 21 year lease at £520 pa. Earlier in 1776, 70 acres of the Barton Farm was offered for let in the Flying Post and the land is described as in “extraordinarily good condition...fit for a dairy, or feeding cattle...”. At the Auction of January 1779 the Manor sold for £90,000 but the buyer failed to complete the contract and it was eventually sold to Denys Rolle for £72,000 in 1785. Thomas Tillman died in 1787 and his widow managed the Farm until 1795 when her son took over. In 1785 it is reported in the Flying Post that “William Hare, a boy about 16 years of age , near 5 foot in height of a red complexion absconded from his master, Mr. Thomas Tillman .......carried off several things besides his clothes. Whoever shall harbour the said boy shall be punished as the Law directs”. 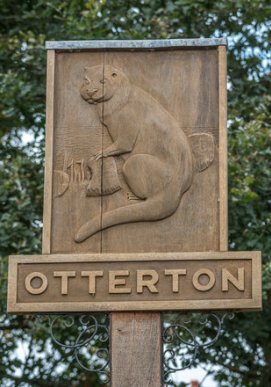 Early in 1802 it was decided to divide Otterton Barton of 751 acres, which included 99 acres of poor grazing land in the Otter Estuary. 435 acres were allocated in the south to “South Farm” and 270 acres to Otterton Barton Farm. They were both rented for 14 years. Charles Tillman was moved to South Farm and Mrs. Mary Bastin and her 3 sons John, James, & William were rented the Barton—“All that part of the Barton – dwelling house and offices--- with pidgeon house, garden and kennel garden...” By 1814 Mrs. Bastin had died and her eldest son John was moved to South Farm which had been vacated by Charles Tillman. The Barton was put out to tender in the Flying Post of “an exceeding good house and other conveniences , 10 acres orchard, 34 of rich meadow and 235 more or less of arable and pasture land with the use of a lime rock and kiln adjacent the premises”. The limekilns location is not marked on the 1844 Tithe Map so presumably was no longer in use. There was a limekiln on South Farm land in use at that time which may have been the one indicated in the Flying Post. Thomas Burrows took a new lease at the reduced rent of £320 in 1815. After the end of the Napoleonic Wars in 1815 corn prices fell dramatically and in Britain rents could not be paid and many farmers were ruined. It could be that because of this depression in the market that dictated the reduced rental of the new lease for the Barton Farm. Early in 1828, John Staddon, Mr. Burrow’s apprentice at the Barton, ran away and the Flying Post reports on the dire consequences to anyone harbouring or employing him. He was the 19 year old son of a labouring family in the village. The 1844 Tithe Map shows the Barton surrounded with barns and Spreats engraving of 1842 and Lynes watercolour of 1833 both show one of these. It has two dormer hatches for hoisting grain sacks. The Tithe Award and 1841 Census give a clear picture of the Barton Farm and lands. William Burrows had succeeded Thomas and was living at the farmhouse with his family ,5 servants and an apprentice. He is farming 230 acres of arable, 18 of pasture 5 of coppice and 10 acres of orchard. By the 1840’s farmers are prospering. The EFP reports‘Grain of every kind is steadily advancing in price’. 1851 Charles Harding takes the Barton Farm tenancy. He died in 1867 and his wife Mary and sons Richard and Samuel continued running the farm. The Land Agent, Robert Lipscombe, wrote to Mrs. Harding offering to reduce her rent by £20pa ‘but not to divulge to anyone’. 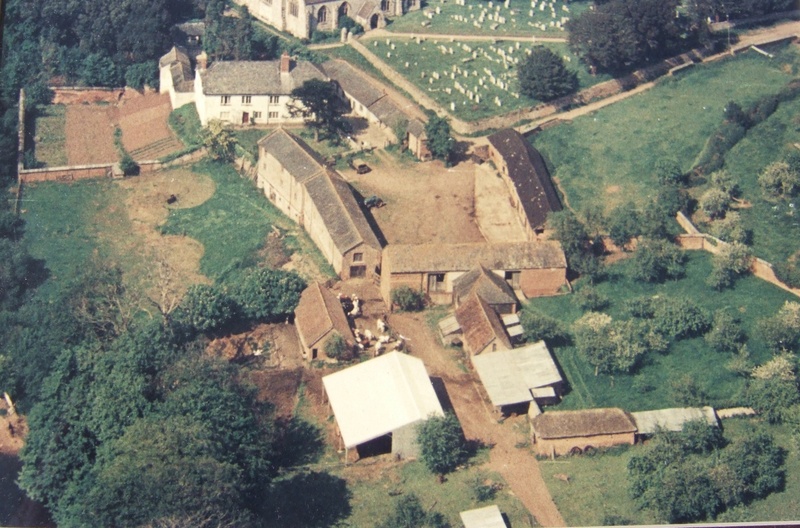 In 1870 Otterton Church was rebuilt necessitating a barn close to the old Church being demolished. A new barn with the legend ‘MR 1870’ was built to the south of the farmhouse, with griffin statues high on the gable ends, which are said to have come from the old Priory buildings. 1879 a mob set light to ricks on Barton farm, causing considerable damage. The agricultural depressions of the 1870’s do not appear to affect S.E.Devon due to the rapid development of Exmouth and Budleigh Salterton requiring an increase in farming produce. Improved farm machinery required and extension to the 1870 barn and Barton Farm with the legend “MR1887” and the labour force increased to 8. Samuel Harding at Barton Farm fared well during the early Depression period and in 1888 he also is taking over the lease of Otterton Mill. Two years then pass and he is running into financial difficulties at the Mill. By 1894 he has passed the Lease to John Ireland. Mr.Harding is having problems paying his Barton Farm rent and by August 1902 has given notice to quit. The Estate was anxious for him to stay as he was held in high regard as a tenant. Early 1906 he is in poor health and again gives notice to quit and Sydenham Carter takes over. By this time farmers financial problems had been eased by the introduction of a 1/- per quarter duty on imported wheat and the agricultural industry had picked up. Sydenham Carter died in 1918 and his sons continied farming Barton Farm until 1943 Fred Carter, the last of the brothers aged 67 gave up the lease. Herbert Gibbs took the Lease and he made a few changes including a portable milking parlour(bale). On his death his son erected barns and outbuildings south of the cowsheds. He retired in 1972 and the Barton Farmhouse was leased to Michael Harrison. The Dairy Farm was run by a Manager, Richard Crowther, followed by Michael Hawkins and the whole herd was transferred to a new dairy unti at Otter Farm, Colaton Raleigh in 1989. 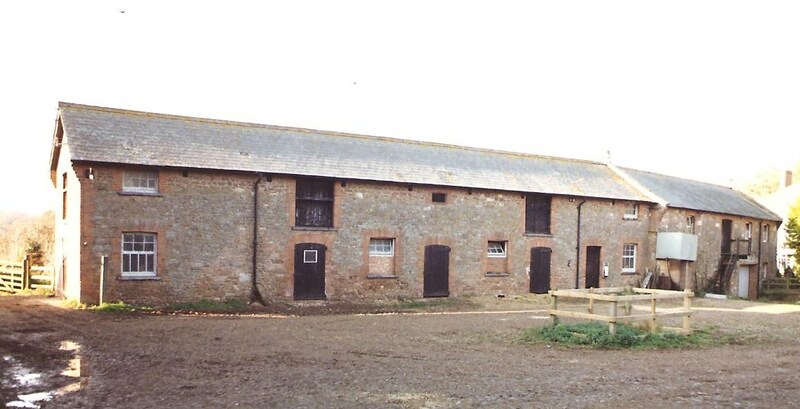 In 1988 the Estate applied for planning permission to develop the Barton Farm buildings into 14 dwellings. After five further applications were made and refused to 1992 an application to convert the MR barns into 3 dwellings with 9 new houses in the courtyard were approved. Many of the objections during the 4 years had come from Budleigh Salterton people! Another 7 years passed before the very attractive Rolle Barton houses and forecourt were offered for sale in 1999. Clinton Devon Estates Archives : Letter Books, Leases & Documents, Survey 1790, Tithe Apportionment, Rent Ledgers Devon Record Office: Land Tax, 1779 Auction Prospectus, Otterton Vestry Book, Militia Orders, Exeter Flying Post 1776/1884, National Census, Directories.